Earlier this month, a cat named Bento passed away in his home of Spokane, Washington at the age of nine. While the death of a pet is sad under any circumstances, Bento was more than just a pet. He was an internet legend—or, at least, the successor to an internet legend. Bento was the second Keyboard Cat. The original Keyboard Cat, Fatso, who first donned a blue shirt and had his arms manipulated so it looked like he was playing a funky keyboard tune, died way back in the late 1980s. Twenty years later, Fatso’s owner Charlie Schmidt posted a clip from the original VHS taped performance to a new video-sharing platform called YouTube and the clip soon joined the ranks of other, wildly popular cat-centric memes. The 54-second clip was remixed countless times as “Play Him Off, Keyboard Cat” became the preferred way to shut people down on internet message boards. It even inspired actor Ron Livingston to join and immediately leave YouTube. For a few years there, Fatso’s synth-organ song seemed inescapable. Realizing the public had an insatiable hunger for Keyboard Cat content, Schmidt, according to The Spokesman-Review, “scoured animal shelters for a suitable replacement” for Fatso. Which is what brings us to Bento. 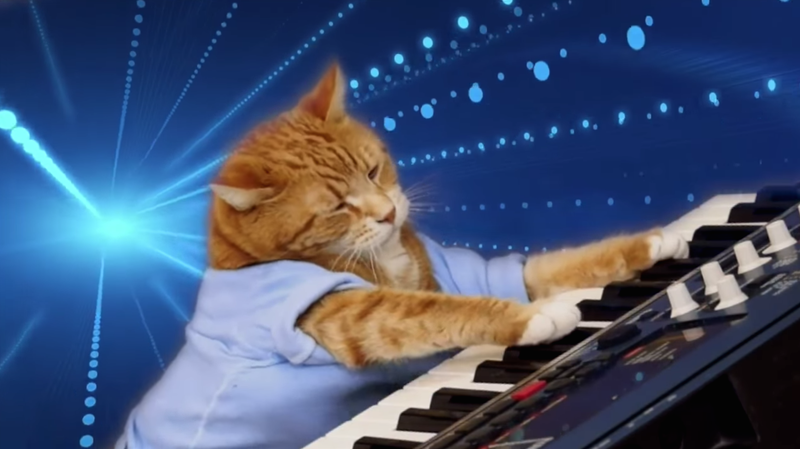 In the years following the original Keyboard Cat video’s success, Bento would star in dozens of related videos, including a parody of Miley Cyrus’ “Wrecking Ball” and a commercial for Wonderful Pistachios. He, or more accurately Schmidt, would also go on to sell tons of Keyboard Cat merchandise and travel the cat conference circuit with the likes of Lil Bub and Grumpy Cat. While Bento may not have been the original Keyboard Cat, the one we first fell in love with, he was undeniably the much more prolific spiritual successor. Considering the public’s relationship with memes has become more hostile in recent years, it’s unclear how many Keyboard Cats there can be. Is it like James Bond, a role to be repurposed and reinterpreted for each generation? Perhaps. Maybe Charlie Schmidt has some more tunes up his sleeve that can only be performed by an orange tabby.